As it has been clearly demonstrated throughout the history of mankind, whenever new weapons are invented, they invariably give an edge to the most developed state at the time, allowing it to pursue further expansion of its dominance upon the international stage. Immediately after the creation of nuclear weapons, they were promptly tested in the course of two monstrous attacks on the peaceful citizens of Hiroshima and Nagasaki during the closing phases of the Second World War. Those tests resulted in massive euphoria among the American ruling elite who then contemplated bombing one of their allies in the war, namely the USSR, back into the stone age. However, by the time the United States accumulated a nuclear arsenal sufficient for the destruction of the USSR, Moscow managed to build its own nuclear weapons at the cost of heroic efforts of its people, which allowed Russia’s population to escape this terrible fate. In recent decades, the broad possibilities of the Internet and various media platforms allowed Washington to take down states pursuing a policy of their own through the use of so-called “color revolutions.” This meddling resulted in the entire Middle East plunging into political chaos, which created preconditions for a number of armed conflicts in the course of which hundreds of thousands of civilians lost their lives. It goes without saying, of course, that the military-industrial complex of the United States and its NATO allies received super-profits from those conflicts through arms sales. These days, new advances in IT, along with new inventions in the field of biological, chemical and space warfare are further fueling the deranged fantasies of American military strategists. Many of the hawks occupying high-profile positions within US society are literally prepared to use any sort of weapon in the vain hope of securing primacy over the entire world, even if it means destroying half of the world’s population in the process. As many analysts believe, the war of tomorrow will not be waged with bullets and bombs as it will be taking place in an entirely different dimension – on the Internet. The hackers of today are capable of taking down any control system, hydroelectric power plants, or even a nuclear reactor. Therefore, a total of 19 hackers can inflict significantly more damage than the notorious 19 terrorists that hijacked four civilian jets on September 11, 2001, staging the most terrifying terrorist attacks in the history of the United States. Many countries have already begun an arms race in cyberspace, and it’s hardly a secret that the US and UK are occupying leading positions in it now. Suffice it to recall that the war in Iraq actually began in 2002 with powerful cyber attacks against the Iraqi government. By exploiting the latest advancements in the field of cyber weapons, the CIA and the Pentagon infiltrated the information system of government agencies in Iraq, directly addressing each of the leaders of the ruling Ba’ath party and high-profile military figures, bombarding them with faxes, emails and phone calls. The attackers urged them to stage a coup d’etat and surrender all state and military secrets to the US, ordering troops to desert after the initial outbreak of hostilities, thus sabotaging and undermining the power of Saddam Hussein and the Iraqi state. To provide themselves with an excuse to further develop and deploy their cyber capabilities, Washington initiated massive public hysteria over the alleged meddling of Russia into the internal affairs of the United States, Britain and other Western countries. However, no special commission created to investigate the allegations in the United States or Britain have been able to provide any credible information to back these accusations up, forcing the US government to admit it was nothing but hearsay. At the same time, along all sorts of fake publications in the Western media, one can come across reports of cyber attacks being used by the United States and Britain as a tool of meddling. For example, Norway has recently released documentary evidence that Norwegian military intelligence in cooperation with US intelligence agencies would hack Russian communications networks for obtaining military strategic information on Russia’s defenses. This information is confirmed by the report of the US National Security Agency (NSA) on cooperation with the Norwegian military intelligence. As part of cyber command of the US armed forces, a special “Russian group” was created, as it was reported last July by the commander of the US cyber command, Genera Paul M. Nakasone. The Pentagon’s contractor COLSA has recently announced recruitment of additional agents tasked with monitoring Russian social networks; hiring people with a strong command of the Russian language. According to Newsweek, the FBI hacked computers in more than a hundred countries in 2015, and it turns out one of those was Russia. It’s also curious that the Trump administration has recently reversed an Obama-era memorandum dictating how and when the US government can deploy cyberweapons against its adversaries. Further still, NATO secretary general, Jens Stoltenberg announced the inclusion of national cybernetic elements, which are often described as offensive task teams within the NATO chain of command in early October. He also confirmed that NATO was planing to pursue cooperation with Kiev in the field of offensive cyber operations staging. However, Ukraine is hardly the only state that is going to become a base for all sorts so-called “white hats”. 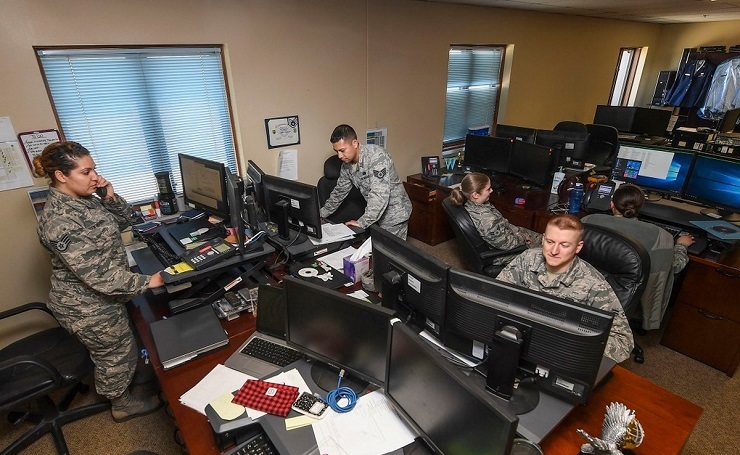 With the help of the United States, five centers of cyber operations have already been deployed across Europe – in Finland, Estonia, Poland, Germany and France. One can often come across reports that the NSA and US cyber command can exercise near-godlike omniscience over the Internet. The so-called cyber-troopers that they employ are drawn from all four branches of the military. Many deploy overseas, but many of them also drive to work each day in the suburban sprawl between Washington, DC and Baltimore at the National Security Agency at Fort Meade. However, Russia is hardly the only target that will become the victim of those malicious activities, as Washington may start spreading disinformation, panic, plant frustration with the ruling elites, and stage new revolutions in virtually any state that finds itself in the way of American designs. This is the world we’re living in today. To many, it resembles the calm before the storm. As countries accumulate huge destructive capabilities, Western policymakers are just waiting for a pretext to unload them. Along with that. There is also a growing understanding that there can be no winners in modern wars, but only losers. Just recently, Robert Hannigan, former director of CHQ, announced that the situation in cyberspace has become so tense that it can trigger a Third World War at any given moment. That’s why he’s convinced that we need to come to some kind of international agreement over what’s acceptable and what isn’t on the Internet, before it’s too late. Against this backdrop, it’s obvious that Russia has made an important step at the 73rd session of the UN General Assembly, proposing the international community to develop a convention on combating cybercrime and develop rules of engagement across information space. In the same aspect, the adoption by the Third Committee of the UN General Assembly of a Russian resolution draft on countering the use of information and communication technologies for criminal purposes (the document was supported by a total of 88 states) deserves particular attention, since it has the potential of cooling the heads of a number of Western strategists keen to see the world drawn into a conflict, cyber or otherwise.